There is something uniquely invigorating about swimming in an ocean pool, wouldn't you agree? Perhaps it is the salt water, or the motion of the waves, the fish swimming beneath you or the fresh air and coastal views. 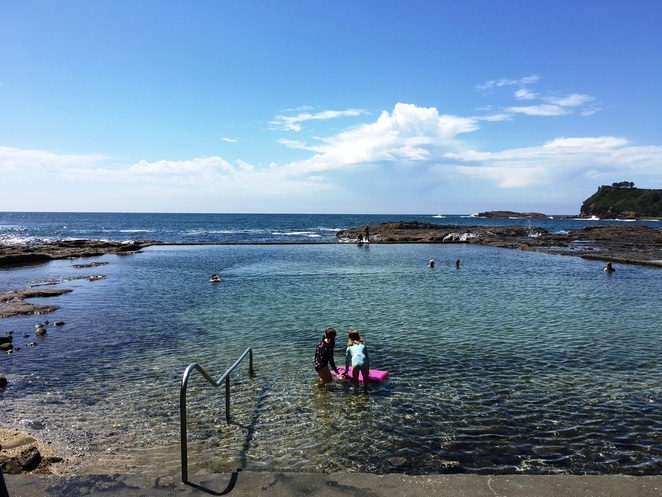 If a leisurely dip in the ocean is what you crave, without those pesky, unpredictable waves bothering you, a beautiful rock pool is the answer. The Boat Harbour Rock Pool in Gerringong is a secluded and uncommonly picturesque option. 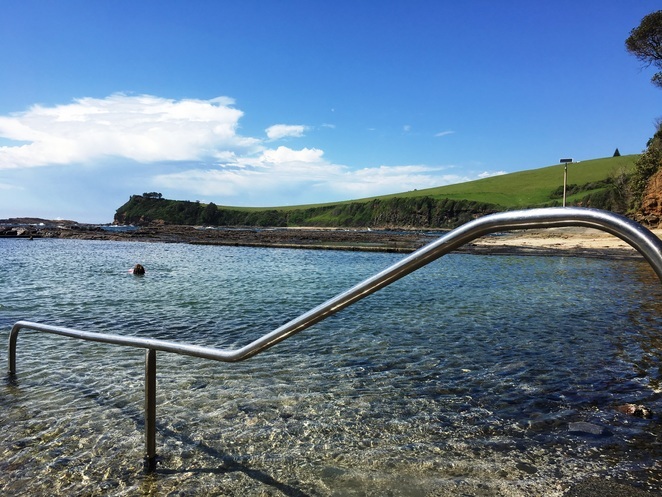 Tucked away from the crowds of Werri Beach, the Boat Harbour Rock Pool is located on the northern side of Gerringong's Boat Harbour. Access is via Jupiter Street and there is ample parking available. From Boat Harbour Reserve it is a short walk to the rock pool. There are a number of interpretive signs along the walkway sharing the history of the harbour and the rock pools. A small toilet block and change room are also located in the nearby reserve. 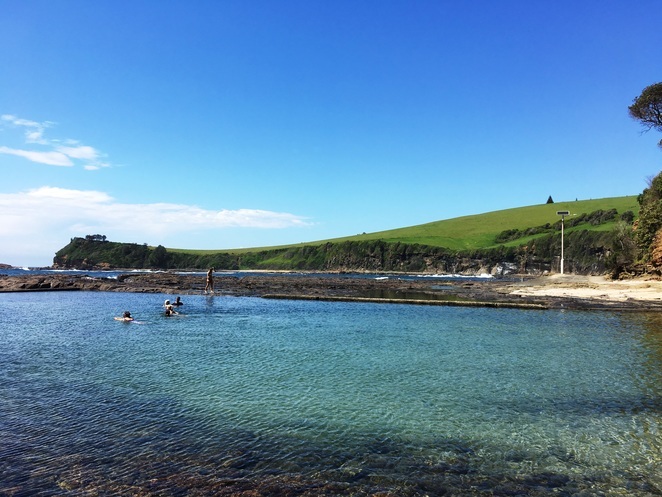 The rock pool is situated spectacularly below the cliffs and features ocean views to the north and picturesque green farmland to the south. This rock pool dates from the early 1900s and was once designated for use by "Ladies Only", however, these days is open for all to use. Wouldn't you like to plunge, dip, paddle, float or swim here? The pool is large and open, approximately 30 metres in length, and has a natural floor of sand and rock, with some weed here and there. There is a railing to help you walk in and out and it is also possible to walk all around the entire edge of the pool if you are game and if weather conditions permit. On this particular day, the water was chilly as I entered but it didn't take long at all to adjust to the temperature and I had a lovely, refreshing swim. There is one steep section in the middle of the pool where I couldn't stand up, but otherwise, it is quite shallow. The pool is popular with locals swimming laps, or enjoying a quick dip and with parents and young children keen for a paddle. On the cliff side of the pool, you will find concrete steps to sit on or to leave your towel while you swim. Facilities at the nearby reserve include a small block of toilets which also include change rooms and showers. For those wanting to bring their own picnic, there are BBQs and picnic tables and an attractive grassy area to enjoy. The Boat Harbour Rock Pool can be accessed from Jupiter Street, Gerringong. From the boat ramp follow the path beside the reserve until you reach the rock pool. N.B. It is important to note that as ocean conditions change from one day to the next, during periods of high seas the pools may be unsafe for swimming. Similarly, it is important to be aware that as the pools are tidal and open to the ocean wave action may introduce marine stingers and other creatures into the pool.